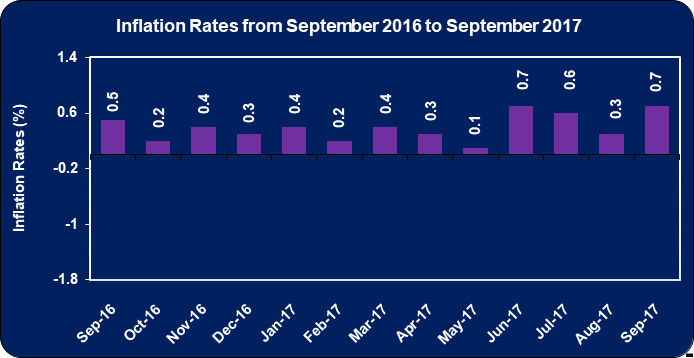 The inflation rate for the month September 2017 was 0.7%, following an upward movement of 0.3% in August 2017. The division which recorded the highest movement for the month was ‘Housing, Water, Electricity, Gas and Other Fuels’ with a 2.6% growth, while the index for ‘Food and Non-Alcoholic Beverages’ advanced by 0.4%. STATIN reported that the increase in ‘Housing, Water, Electricity, Gas and Other Fuels’ was influenced mainly by an increase in electricity rates, while increases within the ‘Food and Non-Alcoholic Beverages’ division was due mainly to a 1.1% upward movement for the group ‘Vegetables and Starchy Foods’. Other notable increases were for the divisions: ‘Restaurants and Accommodation Services’ (1.0%) due to increase in prices for meals consumed away from home and ‘Education’ (2.0%) as a result of higher tuition fees. As noted earlier, the ‘Food and Non-Alcoholic Beverages’ division reported a 0.4% increase for September, relative to 0.6% movement in August 2017. The group ‘Food’ rose 0.4%, while ‘Non-Alcoholic Beverages and Tobacco’ increased by 0.2%. The increase in the price of ‘Food’ was driven by a 1.1% increase in the class ‘Vegetables and Starchy Foods. For the ‘Non-Alcoholic Beverages’ group the main driver of growth was ‘Coffee, Tea and Cocoa’ up 0.5% and ‘Mineral Waters, Soft Drinks, Fruit and Vegetable Juices’ up 0.1%. The ‘Alcoholic Beverages and Tobacco’ division recorded an increase of 0.1% for September 2017. An increase in the price of ‘Spirits,’ ‘Wines’ and ‘Tobacco,’ were the main contributors to the movement. Meanwhile, the index for ‘Clothing and Footwear’ went up by 0.4% for September 2017, as both ‘Clothing’ and ‘Footwear’ division recorded a 0.1% and 0.9% increase respectively. For the month of September, the division ‘Housing, Water, Electricity, Gas and Other Fuels’ posted a 2.6% increase. The ‘Electricity, Gas and Other Fuels’ was the main driver behind the growth, this as the group recorded a rose by 4.8%. Also contributing to the upward movement within this division were the groups ’Rentals for Housing’, going up by 0.8% and ’Maintenance and Repair of Dwelling’ up by 0.1%. In contrast the groups ‘Water Supply and Miscellaneous Services Related to the Dwelling’ declined by 0.9%. The index for the ‘Transport’ division increased by 0.2% for the period under review. This was mainly attributable to a rise in prices for petrol which was tempered by lower costs for air travel. For September 2017, the ‘Communication’ division recorded an increase of 0.2%. This was mainly as a result of an increase in local and international calling rates for residential landline service. The ‘Health’ division rose by 0.2% in September 2017. This was as a result of a 0.4% increase in the group ‘Medical Products’. Furthermore, the division ‘Restaurants and Accommodation Services’ moved up by 1.0%. An upward movement of 0.2% was recorded in the index for the division ‘Miscellaneous Goods and Services’, while the index for the division ‘Education’, rose by 2.0% for the period under review. The main contributing factor to this increase was the rise in tuition fees at the beginning of the new school year. Analyst Certification -This research report is for information purposes only and should not be construed as a recommendation. Each research analyst (s) also certify that no part of their compensation was, is, or will be, directly or indirectly, related to the specific recommendation (s) or view (s) expressed by that research analyst in this research report.